Right Resources for dyslexia in the workplace. - Right Resources ....for a thriving and productive neurodiverse workforce. There are countless individuals struggling with day to day work tasks who are dyslexic yet have never even considered that their challenges could be related to a Specific Learning Difference such as dyslexia !! Dyslexia affects 10 - 15% of the population. (It is estimated that 40 - 50% of these individuals are also affected by dyscalculia). Dyslexia is not purely about challenges with reading and writing. There are countless 'literate dyslexic' individuals who may not have any problems with literacy. 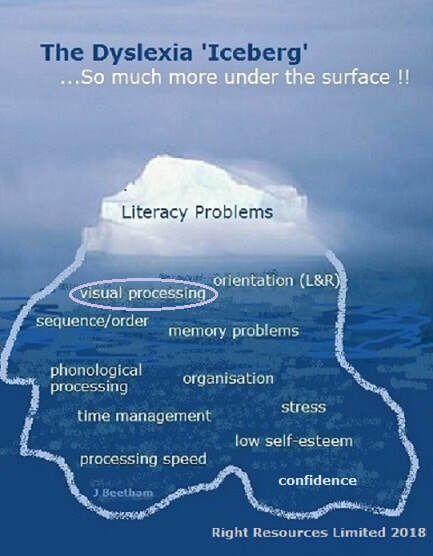 However as the Dyslexia 'Iceberg' diagram shows these individuals will have a mixture of these underlying challenges affecting them throughout their lives. Difficulty with organisation, structuring written documents, remembering what they need to take with them to meetings, difficulty meeting deadlines, problems with time-keeping .... and So much more. It is also recognized that, in general, dyslexic individuals have key strengths including; being creative, being good at problem solving, big picture thinking and being innovative. Aren't these the very skills that help businesses to develop and grow? People friendly workplaces enable these individuals to explore their strengths, gain in confidence and start to realize their potential. We work within all sectors providing a range of services including: workplace needs assessments, awareness training, one to one strategy coaching support and consultancy.